Rae of Light is the 12th Book of USA TODAY author W.J. May's bestselling series, The Chronicles of Kerrigan. It's time to face the music—except there is no music, just a low warning of a war that is to come. There are no other options but to confront Cromfield. No more running, no more hiding. Rae Kerrigan will be forced into an eternal life sentence if they do not stop him. Except, how do you stop a madman that cannot die? How do you risk the lives of everyone you love, your family, friends and the lives of innocent people? Rae is running out of time time and possibilities. 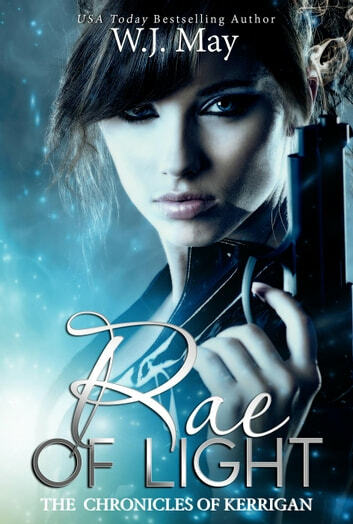 It's up to Rae to find a way to undo the dark evil in her family's past to have a ray of hope for everyone's future. I've read the whole series of the Kerrigan Chronicles, from beginning to end, and I wish that I could read them all afresh again. An amazing set of stories and the characters really drew me in. I feel all adrift now that I'm done, I'm not sure what to do now that I no longer have Rae's life and adventures to read about. I totally enjoyed this series, purchasing all 12 books. My only question is, "When is the next book coming out?" Talk about a cliff hanger! A fabulous ending to a fantastic book series. I love Rae and Devin and I hope to have the pleasure of reading many more books with them in them with their family and children and friends. Im enjoying the whole series. Its has magic, romance and relationships. A bit of light reading with young characters. Its been entertaining.